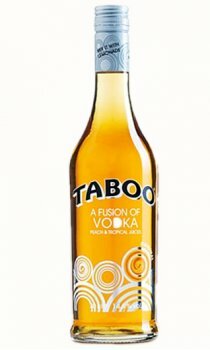 Taboo is a light, refreshing drink bursting with flavour, made from an intriguing blend of white wine, exotic fruit juices and vodka. Sadly, with the arrival of more 'trendy' vodka based drinks in recent years, Taboo has become somewhat overlooked. This is a tragedy, for in my opinion its unique tangy taste and fruity nectar outshines any of its contemporaries. The combination of an ice cold glass of lemonade with a 'phat' shot of Taboo really is a taste of summer!